Did the Founders of America believe that the survival of the Republic depends on America's acknowledgement of Jesus Christ? Most educators and political theorists of our day answer with a resounding "no!" Nevertheless, the evidence is decisive. In their official pronouncements, the Continental Congress--quintessential Founders--forthrightly requested that God establish American independence on Christianity and Christian morality. They affirmed that Christianity is the foundation of national happiness as well as national prosperity. You must see the evidence with your own eyes. 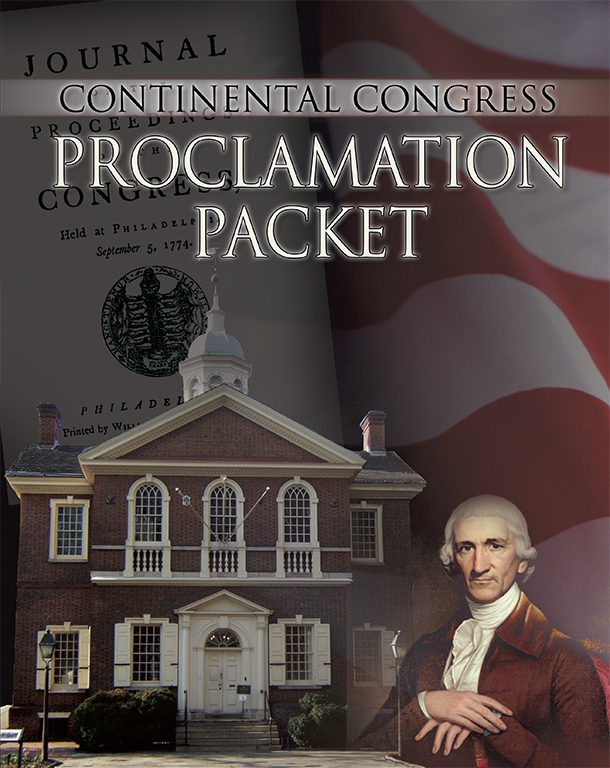 Intended as a supplement and companion volume to America's Most Pressing Concern, the Proclamation Packet contains all 15 proclamations issued by the Continental Congress from 1775 to the conclusion of the Revolutionary War in 1783. Printed on colored, textured stock, these proclamations are copies of the original images as published by Congress. Suitable for framing, each page has perforations for easy removal. Included as a bonus is a full color copy of John Trumbull's "Declaration of Independence." Also consider purchasing Christ and the Continental Congress, a hard-back, coffee table book on which the America's Most Pressing Concern DVD is based. This DVD has eight sessions @ 30 minutes each -- Approximately 4 hours of eye opening material. Bulk Order Details - Special Pricing for 20 or More! This item can be purchased at a rate of $2.00 ea. if bought in quantities of 20 or more. Please call (800) 234-8558 between the hours of 8:00 a.m. and 5:00 p.m. central time to place bulk orders. We apologize but we are unable to fill bulk orders on this item via the Web store. For this product, a small handling fee will be applied before we ship your items. Please reference the following chart for rates. This rate is based on USPS Media Mail. Should you choose another shipping method, similar charges will apply.